We just got home with our two beautiful twin girls…Kylie and Peyton. Their birth was everything I hoped it would be. It wasn’t perfect but the outcome was…two naturally birthed twins with very little p**n! I though that I was going into labor on Saturday, June 2 because my pressure waves were 5 minutes apart and 45 seconds long. But they just didn’t seem strong enough to rush to the hospital. So I ate breakfast and drank a liter of water and the waves completely disappeared. I knew they were coming soon though because I had lost my mucus plug the night before and was having bloody show. So we stayed close and finished my nesting activities. grab me some more towels and then lets head to the hospital! I called my parents and told them to rush to the hospital because I knew they would come fast. I got my mp3 player out and started listening the my birth guide. It was great. I stayed so calm and in control. Very strong pressure waves started once we got in the car. I just kept turning my switch to off. Once I turned it to off it seemed the pressure would almost disappear and I would wonder if it was over yet. I couldn’t believe how easy it was and though that I couldn’t be that far along yet. We got checked into the hospital and found that I as already at and 8. My doctor didn’t even have time to get to the hospital so I got a stand in. I just stayed focused with each pressure wave. Luckily my nurse was familiar somewhat with Hypnobabies and acted as my advocate when people tried to talk to me. I remember the IV guy sticking my hand asked, “can she hear me”? What seemed like minutes later they checked me again and I was at a 10 an fully effaced. I remember nurses and people talking to each other very surprised that I was at a 10 and so calm and relaxed. focus into my ear. I tried to breath the babies down with and “AHHHH” but my doctor yelled at me not to make any noise and grunt them out basically! It felt SO unnatural!! The only time I felt p**n was at this point and I just couldn’t stay in hypnosis with all the commotion. But I pushed out Kylie in 5 pushes. My body let me rest about 5 minutes and then pushed out Peyton in 2 pushes. They were born 1 hour after checking into the hospital. 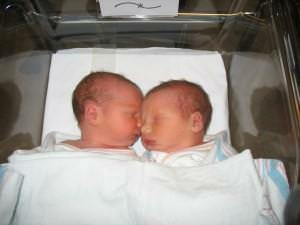 Even though they were one month early they were both 5 lbs + and very healthy. 3 days later and they are home with us! I was nicknamed wonder woman! None of the nurses could believe how smooth the birth went…and for twins! Every time I would get a new nurse they would already know about me and my birth. I love telling people about Hypnobabies because it works SO well! I literally felt no pain the entire time I was getting to a 10! It helped me stay calm and my recover was so easy!! No tearing, no drugs…so awesome! It was a ton better than my first birth. Sorry this is SOOO long! I am just so grateful to have had almost the most perfect birth and very healthy, if little twin girls! I definitely know what to do different next time! Good luck to all you moms!